What It’s About: Young swordsman D’Artagnan (Michael York) becomes a musketeer himself, and joins his three friends in foiling plots against the Queen (Geraldine Chaplin) and her chambermaid (Raquel Welch). Why Watch it Today? : The Three Musketeers are the most famous creation of author Alexandre Dumas, born today in 1802. 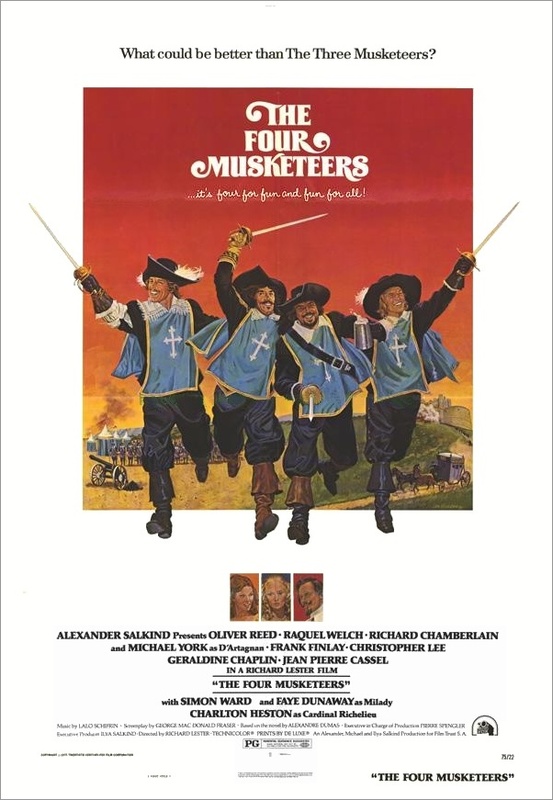 Today’s movie is actually the second half of The Three Musketeers, shot at the same time, resulting in a lawsuit by the actors against the producers (who only paid them for one film). Unsurprisingly, it’s just as much fun as the first half, with its stellar international cast, lavish production values, and fine swashbuckling action leavened with comedy. This entry was posted in Action, Adaptation, Adventure, Based on a Book, Comedy, Drama, Event Film, Independent, Movie of the Day, Period Film, Sequel, Swashbuckler and tagged Britain, Charlton Heston, Christopher Lee, Faye Dunaway, France, Frank Finlay, Geraldine Chaplin, Jean-Pierre Cassel, Lalo Schifrin, Michael Gothard, Michael York, Oliver Reed, Panama, Raquel Welch, revenge, Richard Chamberlain, Richard Lester, Roy Kinnear, Simon Ward, Spain, Sybil Danning.